Well, it's been some time in the making now, mainly because one of the factories we work with was taking forever to get back to us Jesus Christ. But, that's all passed now and we're cool, we're cool. 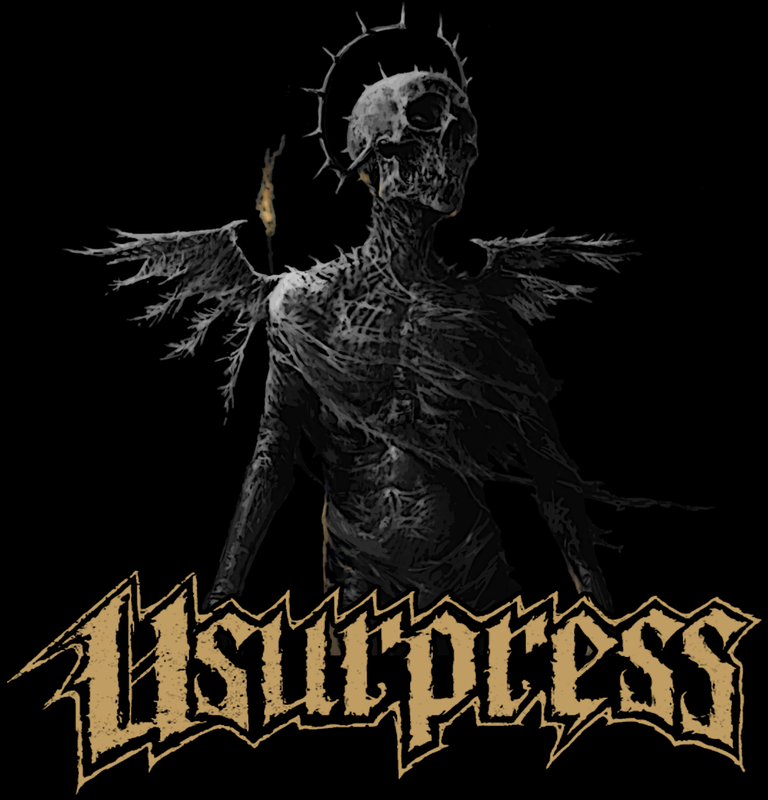 Anyway, we've been chatting with the guys from Usurpress for several months now, after reviewing Ordained and then shortly thereafter conducting an interview with their vocalist Stefan Pettersson. So then we got to chatting some more, and some more, and decided since we liked their latest work so much, that we should probably release it on cassette, so there's that, and this. Our latest package here is another limited cassette/shirt run, and we mean LIMITED. The production numbers are based solely on how many orders we receive over the next month, and other than some extra copies we make for the band of the tapes and shirts, it's gone forever. In each package you get one cassette and one shirt. The cassettes are professionally packaged, music-grade ferric. The shirts are 100% preshrunk cotton, with the image above silk-screened on black. Ready to order? Then all you need to do is read the following and then click further below to be taken to the new store we just put together this week. PLEASE NOTE that production will begin roughly two weeks into the ordering phase and will take a minimum of TWO WEEKS to complete. This means packages will not be shipping for at least ONE MONTH. Artwork for the T-Shirt is as seen ABOVE. The cassette layout is slightly different but utilizes the same artwork. $25 per package. Surcharges are added for each shirt size above XL. If you need a shirt larger than 3XL or an odd size, please contact us. Shipping is NOT included in the price, this is factored in during checkout depending on your location. $10 for USPS in the US and territories, $20 worldwide. Multiple packages may be purchased.